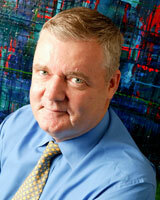 Jim Macnamara is Distinguished Professor of Public Communication at the University of Technlogy Sydney. Prior to joining UTS in 2007, he had a successful 30-year career in professional communication practice spanning journalism, public relations, advertising, and media research. Immediatey prior to joining the academy, he was the founder and CEO of the Asia Pacific office of the global media research firm CARMA International, which he sold to Isentia (formerly Media Monitors) in 2006. Jim is also a Visiting Professor at The London School of Economics and Political Science, Media and Communications Department, and a Visiting Professor at the University of the Arts London, College of Communication. He is internationally recognised for his research into evaluation of public communication including advertising, public relations, and government communication and his research into organisational listening has been described as "of major international significance". In 2017 he was presented with The Pathfinder Award,"the highest academic honor" awarded by the Institute for Public Relations (IPR) in the US for his scholarly research, and The Don Bartholomew Award for "outstanding service to the communications industry" by the London-based International Association for Measurement and Evaluation of Communication (AMEC). He is the author of more than 100 journal articles, paper and research reports and 16 books including, most recently, The 21st Century Media (R)evolution: Emergent Communication Practices (Peter Lang, New York, 2014); Organizational Listening: The Missing Link in Public Communication (Peter Lang, New York, 2016); and Evaluating Public Communication: New Models, Standards, and Best Practice (Routledge, UK, 2017). Jim Macnamara is a Fellow of the International Association for Measurement and Evaluation of Communication (AMEC) headquartered in London and Chair of the AMEC Academic Advisory Group. He is also a Fellow of the Australian Marketing Institute (FAMI) and a Certified Practicing Marketer (CPM), a Fellow of the Public Relations Institute of Australia (FPRIA), and an elected Member of The Arthur Page Society in the US. He has conducted research for and consulted to the UK Government Communication Service headquartered in The Cabinet Office, Whitehall; the European Commission Directorate-General for Communication; and the New South Wales Department of Premier and Cabinet on evaluation of public communication and listening and engagement. * A dozen award-winning case studies of evaluation of public communication campaigns and projects. Organizations including government departments and agencies, corporations, and non-government organizations claim they want and practice two-way communication, dialogue, and engagement with citizens, customers, employees, and other stakeholders and publics. But do they in reality? Voice—speaking up—is recognized as fundamental for democracy, representation, and social equity. But what if organizations are not listening? This book reports findings of a two-year, three-continent study that show that public and private sector organizations devote substantial and sometimes massive resources to construct an 'architecture of speaking' through advertising, PR and other public communication practices, but listen poorly, sporadically, and sometimes not all. Beyond identifying a 'crisis of listening', this landmark study proposes that organizations need to create an architecture of listening to regain trust and re-engage people whose voices are unheard or ignored. It presents a compelling case to show that organizational listening is essential for healthy democracy, organization legitimacy, business sustainability, and social equity and brings benefits to organizations, their stakeholders, and society. This book examines the major changes taking place in media today, including the phenomenon of Web 2.0 and social media, and expertly synthesizes competing theories and the latest data, including international research from fast-growing markets such as China and Taiwan as well as the US, UK, Europe and Australia, to provide a comprehensive, holistic view of the twenty-first century media (r)evolution. The book identifies that the key changes are located in practices rather than technologies and that public communication practices are emergent in highly significant ways. After critical examining latest developments in digital and social media, it explores the implications for journalism, advertising, public relations and organisational and political communication. The interrelationship between journalism and public relations (PR) is one of the most contentious in the field of media studies. Numerous studies have shown that 50-80 per cent of the content of mass media is significantly shaped by PR. But many editors, journalists and PR practitioners engage in a `discourse of denial', maintaining what critics call 'the dirty secret' of journalism and and PR. Others media practitioners engage in an accusatory `discourse of spin' and a `discourse of victimhood. On the other hand, PR practitioners say they help provide a voice for organizations, including those ignored by the media. Meanwhile, the growth of social media is providing a range of new opportunities for governments, corporations and organizations to create content and even their own media, increasing the channels and reach of PR. This book reviews 100 years of research into the interrelationship between journalism and PR and, based on in-depth interviews with senior editors, journalists and PR practitioners in several countries, presents new insights into the methods and extent of PR influence, its implications, and the need for transparency and change, making it a must read for researchers and students in media studies, journalism, public relations, politics, sociology and cultural studies. Macnamara, J. 2012, Public Relations Theories, Practices, Critiques, First, Pearson Australia, Sydney. A transtheoretical exploration of public relations drawing on systems orientated management theory which is the dominant US paradigm as well as psychological, semiotic, sociocultural, and critical perspectives, along with international case studies and applications, providing a comprehensive text for advanced undergraduate and postgraduate students studying PR or related fields of public communication. This book synthesizes competing theories and disciplinary viewpoints and integrates existing as well as new research to provide a comprehensive, holistic view of the 21st century (r)evolution in media and public communication. The book identifies how major changes are located in practices rather than technologies and identifies 'emergent' practices that will significantly shape the future of the public sphere, journalism, advertising, public relations and companies and organisations. © J. R. Macnamara 2006. All rights reserved. This book presents a landmark in-depth study of how mass media contributes to the making and remaking of male identity. It concludes that, unless addressed, the effects of negative discourse on the self-identity and self-esteem of men, are potentially devastating and that the longer-term and wider social implications will also be costly. A half-century of research has identified that mass media portrayals of women are influential in shaping their self-image and self-esteem, as well as men's and societies' views of women. Comparatively few studies have examined mass media portrayals of men and male identity, and gender studies have often assumed these to be unproblematic. But, in a post-industrial era of massive economic, technological and social change, research shows mass media are projecting and propagating new images of male identity from Atlas Syndrome workaholics and 'deadbeat dads' to 'metrosexuals' and men with "a feminine side" with potentially significant social implications. While there is an important and growing body of research literature on listening, this is predominantly focused on interpersonal listening. Meanwhile, in contemporary industrial and post-industrial societies, organizations play a central role in society and the lives of citizens. People need to interact on a daily basis with government departments and agencies, corporations, and a plethora of non-government and non-profit organizations. Despite theorization of the disciplinary practices of public relations and corporate, organizational, government, and political communication as two-way communication involving dialogue and engagement with stakeholders and publics, a transdisciplinary literature review of these fields reveals that little attention is paid to listening. In addition to identifying this gap in the literature, this article reports empirical research that shows organizations listen sporadically, often poorly, and sometimes not at all. To address this socially and politically significant gap, this analysis makes recommendations as a contribution to a theory and practice of organizational listening. After identification of 'stasis' in evaluation of strategic communication including public relations and corporate communication despite intensive focus for more than 40 years, recent initiatives in measurement and evaluation on three continents highlight a number of important advances in theory and practice. While studies have identified a lack of standards and a narrow focus on 'activities' and 'outputs' in traditional evaluation models and literature, a two-year international study, which examined a number of recently-developed evaluation frameworks and models and accompanying implementation guidelines, identifies several new concepts and dimensions in evaluation, along with some remaining gaps for further research. Based on content analysis of evaluation literature, interviews, and ethnography, this article reports four key findings of recent research and explains how these can contribute to theory-building and practice to transform the planning, implementation, and evaluation of public relations and corporate, government, organizational and marketing communication. Organizations spend more on public communication today than ever before in history. Yet, in the past few years developed Western countries where investment in public communication is greatest have seen a collapse of trust in government, business and major institutions and landmark uprisings of citizens against the persuasion and promotional campaigns of governments, political parties and big business. Industrialized democratic societies cannot ignore events such as Brexit, the election of Donald Trump, 'hung parliaments' in several countries, and increasing challenges to businesses' social licence to operate. This paradox – declining public trust, support, and stability at a time when investment in public communication has never been higher – indicates that there is something wrong in the way organizations seek to engage with their stakeholders and publics today and that change is required. This paper presents a reflective critical analysis of public communication approaches today drawing on a body of recent research rather than a single study, particularly focussing on theories and practices in public relations and 'strategic communication', and compares them with contemporary concepts such as design thinking, emergent strategy, and Theory U to present an argument and a direction for transformation to address the paradox in public communication. Management writer Tom Peters noted that what gets measured is what gets done in organizations. Therefore, measurement and evaluation models and approaches provide insights into strategy. Furthermore, the most widely used approaches to evaluation are based on program logic models that identify objectives, planning, and inputs, as well as seeking to track outputs, outcomes and impact, thus affording insights into the origins of strategy and strategic intent as well, as its implementation. Given increasing focus on emergent strategy and participatory or networked strategy in place of internally predetermined strategy that is unilaterally focussed on an organization' goals and objectives, this article critically reviews widely-used models for evaluation of communication to identify how well they support and enable broader contemporary approaches to organizational strategy and strategic communication. This analysis shows a narrow organization-centric focus on evaluating organizational messaging (one-way communication) directed at achieving organizational objectives in traditional evaluation models and calls for a more open, dynamic and expanded approach to facilitate two-way communication. Furthermore, in showing the important role of formative as well as summative evaluation, this analysis identifies a number of ways that evaluation of communication can inform organizational strategy and transform strategic communication. With a number of Asia-Pacific countries among the fastest growing in the world, the requirements for public relations and communication management are also growing in terms of both demand and professionalism. It is essential that practitioners and academics keep pace with demand and achieve 'international best practice'. In 2015/16, the largest ever survey of PR and communication management in Asia-Pacific was launched as a biannual study, with the second survey undertaken in 2017/18. The survey is modelled on similar studies that have been conducted in Europe since 2007, in Latin American since 2014, and North America from 2018, allowing international comparison. This analysis examines key findings of the latest Asia-Pacific survey and compares results with the 2015/16 Asia-Pacific study as well as with international data to identify trends, areas of growth in professional practice, and gaps and shortcomings to be addressed. The findings are informative for educators, professional associations, and practitioners in terms of the design of undergraduate and graduate courses and ongoing training and professional development. Knowledge, skills, and abilities, referred to as KSAs, as well as competencies, overall competency or competence and, most recently, capabilities, are major foci in human resource literature, particularly that related to recruitment and professional development. They also have increasingly become a focus of study in public relations and corporate, government, and organisational communication. A number of national and global studies have been undertaken to identify the KSAs, competencies, and capabilities required to effectively undertake PR and communication management roles today and in the future. Recently, the Global Alliance for Public Relations and Communication Management completed an extensive review of professional qualifications and educational standards to produce a Global Body of Knowledge (GBOK), and in 2016 commenced a further stage of this research to develop a Global Capabilities Framework. This paper reports findings of a study undertaken to inform a capabilities framework for public sector communication professionals that supports and adds to the findings of the Global Alliance study and provides specific insights into the capabilities required in government communication today and into the future. A number of studies of the knowledge, skills and abilities (KSAs), competencies and capabilities of public relations and communication professionals have been carried out in the USA, UK and other countries. However, most have not engaged to any significant extent with literature in the human resource development field which specializes in defining and developing these characteristics. Also, few studies to date have related the KSAs, competencies and capabilities of practitioners to the key activities of public relations and communication management required for the future. This article presents findings and analysis from a regional survey conducted in 22 Asia-Pacific countries in 2017/18 that compared, for the first time, the capabilities of practitioners in relation to activities identified as the most important over the next three years. This data, and comparison with equivalent regional surveys in Europe and Latin America, confirm a gap in capabilities in relation to key communication activities and suggest a gap in theory as well as practice. The findings and conclusions present a challenge for higher education and professional development for public relations and communication management and point to potential future directions in theory building. Health communication is identified as an important strategy in achieving health outcomes, particularly in supporting preventative approaches to combatting disease and ill-health. In Australia's multicultural society, health communication needs to address a number of CALD communities in order to achieve health objectives and social equity. While cross-cultural and intercultural communication have been widely studied, research shows that health communication often fails to achieve its objectives, particularly in CALD communities. This analysis examines a case study that highlights three key ingredients of effective health communication targeting CALD communities – in-depth qualitative formative research, a collaborative community-based approach, and cultural competency. The case study reveals how a culture-centred approach (CDA) and social ecology model of health communication achieved results that exceeded targets by up to 100% on a relatively small budget, but also revealed gaps in cultural competency that disadvantage some groups. This study contributes to health communication theory and practice, as well as public communication generally, by providing insights into ways to increase effectiveness as well as cost-efficiency, which in turn creates scalability and sustainability. From historical analysis of the early development of public relations evaluation (early 1980s to the early 2000s), this paper shows that public relations scholarship and practice have drawn heavily on media and communication studies in developing models and methods of evaluation, but have not significantly engaged with the large related body of knowledge on program evaluation. While communication and media studies are logical and formative disciplinary homes for public relations (PR), this paper argues that PR is a transdisciplinary field and that program evaluation is a mostly overlooked source of influence and heritage in relation to evaluation. This analysis presents evidence that a disciplinary 'home visit' to program evaluation, which nestles within program theory and theory of change, offers much to overcome the long-standing stasis in PR evaluation and to inform the search for standards. The first comprehensive study of public relations (PR) and corporate communication practices across Asia-Pacific countries has found that, despite being an area of rapid growth, evaluation remains limited, is often not based on reliable research methods, and is focussed on outputs rather than the outcomes of communication. This reflects a worldwide stasis in evaluation of PR that has been identified as problematic by a number of authors. The Asia-Pacific Communication Monitor, a survey-based study conducted by a collaboration of 16 universities across 23 Asia-Pacific countries in 2015, also explored practitioners' skills, and found a significant lag that could account for this stasis. This article reports key findings of this study that contribute insights to address the lack of measurement and evaluation in the growing field of PR that remains a major concern in the academy and industry. Compared with the burgeoning literature on social media use in business organisations, few studies have investigated how social media can aid non-profit organisations such as universities to achieve engagement objectives. Engagement and community building are important for universities in the context of student recruitment, retention, and satisfaction, as well as staff relations and public relations. To advance understanding of this under-studied area, this research examined the use of social media in a New Zealand university. Based on in-depth interviews and content analysis, this study explored the reported tension between the interactive participatory culture of social media and the promotional use for one-way information transmission and persuasion – in short, the shift from passive spectatorship to active co-production. Given the young and social media-savvy nature of universities' key audience – students – this analysis argues that social media can play a facilitative role in university engagement and community building, but that a participatory co-production approach must be used rather than running social media as a 'spectator sport' platform for all but professional content production. It is well established that the internet, and particularly the unprecedented growth of social media, are changing the mediascape and media practices in advertising and marketing, public relations, and journalism. Some of these changes are leading to convergence of genre and practices as well as the much-discussed convergence of technologies of media. This analysis focuses on the first two of these types of convergence, drawing on data from the first Asia-Pacific Communication Monitor, a survey of 1,200 PR and communication practitioners in 23 Asia-Pacific countries. The findings reveal major shifts from the traditional paid, earned, shared, owned (PESO) model of media use by organizations to an emerging 'SOEP model' (shared, owned, earned, paid). This affords new opportunities for practitioners, but also poses practical and ethical dilemmas. An extensive body of literature theorizes public relations as two-way communication, dialogue, and relationships between organizations and their publics. While there are alternative views including public relations as advocacy, most theories emphasize dialogue, co-orientation, and relationships incorporating satisfaction, trust, and control mutuality – even to the extent of symmetry. Critical perspectives propose a 'sociocultural turn' that further emphasizes stakeholders' and societal interests. This analysis draws on a three-country study that reveals a major theory-practice gap and proposes a significant expansion of public relations theory in relation to listening to realize normative notions of public relations and give effect to claims of dialogue and engagement. A critical literature review followed by a two-year, three-country study of the public communication of 36 government, corporate, and non-government organisations in the UK, US, and Australia identified what this analysis calls two 'black holes' in public communication, as they lack illumination and can cause the implosion of organisation-public relationships. This study, which included in-depth interviews, document analysis, and field experiments, identifies this 'dark matter' in the organisation-public communication universe as (1) a lack of listening by organisations and (2) a narrow organisation-centric approach to strategy that focusses on serving the interests of organisations. This analysis proposes that organisations need to counter-balance the 'architecture of speaking' that characterises strategic communication today with an architecture of listening, which in turn will contribute to participatory, networked, or emergent strategy that realises the normative theories of two-way communication, dialogue, and engagement and which can provide tangible benefits to organisations and their stakeholders and publics. The fields of business and management with which public relations interacts and in which it is often located are rife with concepts, models and theories on leadership, performance, and effectiveness. Recently these have turned attention to alleged multiple forms of intelligence, such as Howard Gardner's claims for eight types of intelligence, which have been expanded by others to as many as 150. Gardner also proposed that humans have five minds and claimed that application of these diverse intelligences and minds can enhance human interactions and relationships. This article critically reviews the potential of these concepts and theories to reconfigure PR, identifying some useful insights, but also raising fundamental theoretical questions. The influence of public relations on media content has been shown to be substantial, and research indicates that it is growing through new media practices. However the interrelationship between journalism and PR remains obscured by paradoxical discourses and stereotypes such as 'spin doctors'. This article identifies gaps in the literature and current understandings, and reports findings from in-depth interviews with senior editors, journalists, and PR practitioners in three countries that provide new insights into how the fields of practice interact which debunk some myths, but also expose a need for improved transparency and standards to ensure ethical media practice. Listening is extensively discussed in relation to interpersonal communication, in therapeutic contexts such as counselling and, to some extent, in the context of intra-organizational communication conducted as part of human resources management. However, listening is surprisingly and problematically overlooked in the large body of literature on organization-public communication including government, political, corporate, and marketing communication and related practices such as public relations. Based on critical analysis of relevant literature and primary research among 36 organizations in three countries, this analysis identifies a 'crisis of listening' in organization-public communication and proposes strategies to address gaps in theory and practice including attention to the work of listening and the creation of an architecture of listening in organizations, which can offer significant stakeholder, societal, and organizational benefits. Communication has been identified as 'the organizing element of human life and the basis of human society by sociologists and communication theorists. However, human communication is widely conflated with voice and speaking, particularly in relation to public communication in its various forms including political, organizational, corporate, and marketing communication and cognate disciplinary fields such as public relations. The essential corollary of affording and exercising voice – listening – is extensively discussed in an interpersonal and intra-organizational context, but it is little examined in terms of organization-public interaction, which is a feature of industrialized societies. This article critically examines this gap in the literature and reports findings of a pilot study that identify an important direction for further research essential to enhancing democracy, social justice and equity, and the ethics of organization-public communication. Communication has been identified as 'the organizing element of human life' and the basis of human society by sociologists and communication theorists. However, human communication is widely conflated with voice and speaking, particularly in relation to public communication in its various forms including political, organizational, corporate, and marketing communication and cognate disciplinary fields such as public relations. The essential corollary of affording and exercising voice – listening – is extensively discussed in an interpersonal and intra-organizational context, but it is little examined in terms of organization-public interaction, which is a feature of industrialized societies. This article critically examines this gap in the literature and reports findings of a pilot study that identify an important direction for further research essential to enhancing democracy, social justice and equity, and the ethics of organization-public communication. When a bushfire ignited the Hazelwood coal mine in the Latrobe Valley 150 kilometers (95 miles) east of Melbourne, Australia in 2014 and burned for 45 days sending toxic smoke and ash over the adjoining town of Morwell, crisis communication was required by the mine company, health and environment authorities, and the local city council. What ensued exposed major failures in communication, which resulted in widespread community anger and a Board of Inquiry. This critical analysis examines public communication during the crisis and the subsequent clean-up, and reports several key findings that inform crisis communication theory and practice. have much to say about how this can be done. A critical analysis of international standards for measurement and evaluation of public relations and corporate communication, including the lack of rigorous methodology and a gap between scholarly research and practice. Extensive research over the past 100 years has shown that the interrelationship between journalism and PR is tensioned and paradoxical, with negative perceptions of PR among journalists and trivialization and demonization of PR as 'spin' contrasted by claims of 'symbiosis' and evidence that 40-75 per cent of media content is significantly influenced by PR. However, studies have been predominantly quantitative and most predate the recent `crisis in journalism and rapid growth of new media formats. This article reports in-depth interviews with senior editors, journalists and PR practitioners in three countries that provide new insights into journalism-PR relations today and identify trajectories for future research, education and practice. Report of a pilot study of public communication by organisations that shows allegedly communicative functions including public relations, involve considerable and often massive resources devoted to creating an architecture of speaking and doing the work of speaking on behalf of organisations including government departments and agencies, corporations, and institutions. However, this research raises serious questions about the extent to which organisations listen to those who seek to engage with them. Further, it suggests that organisations cannot effectively listen unless they have an architecture of listening or do the work of listening, and identifies cultural, structural, political and technological components to create this vital missing element in public communication and the public sphere. An anlysis of organisational use of social media in the context of listening which identifies a lack of an architecture of listening and scant resources devoted to the work of listening in organisations, with most infrastructure and work devoted to speaking. This article traces the development of public relations literature and scholarship in Australia from the 1950s to the present day, identifying key developments in local research, courses of teaching and publishing. It reports that, after an initial period of largely imported texts and scholarship, a substantial body of scholarship has developed locally with its own distinctive characteristics. Macnamara, J. 2012, 'Presidential Campaign Communication: The Quest for the White House', DISCOURSE & COMMUNICATION, vol. 6, no. 2, pp. 241-243. A comparative study of social media use by private and public sector organisations in three highly developed European countries and three highly developed Australasian countries examining the main social media used, objectives and governance including staff policies and guidelines, training and monitoring. The study found a lack of governance and a focus on 'control' and the pursuit of organisational objectives, rather than dialogue and engagement with publics and stakeholders. A mixed method analysis of public relations scholarship and practice in Australasia (Australia, New Zealand and SE Asia) drawing on autoethnographic observations over an extended period, supported by empirical analysis of the content of contemporary PR texts and reference books which shows the continuing existence of a dominant paradigm grounded in US functionalism and organisation-centric models. Macnamara, J 2012, 'Review of C. Smith, Presidential Campaign Communication: The Quest for the White House', Discourse and Communication, vol. 6, no. 2, pp. 241-243. Purpose A number of scholars including Benno Signitzer and Jacquie L'Etang have proposed public diplomacy as an alternative model to describe and/or inform the practices of public relations. However, international relations and political science scholars claim major differences between public diplomacy and PR, and few studies have sought to reconcile these claims and counter-claims. The purpose of this paper is to report a comparative analysis of key concepts and principles of public diplomacy. Design/methodology/approach This article reports a comparative analysis of key concepts and principles of public diplomacy and the new diplomacy as described by Shaun Riordan and public relations (PR) as defined in Excellence theory and other contemporary models of PR to identify commonalties as well as divergences, and discusses how these can inform PR theory and practice. Findings This analysis shows similarities between these fields of practice, as well as six unique concepts and principles of public diplomacy and new diplomacy that inform corporate diplomacy and organisational diplomacy as an alternative paradigm to public relations. An analysis of the influence of public relations on journalism and news media, reviewing 80 years of quantitative research and reporting an exploratory qualitative study of the ambiguous and sometimes vexed relationship between journalists and PR practitioners. The status of Australia Day has long generated mixed responses - from patriotic flag-waving, to apathy, to outright hostility. Proponents of 26 January consequently have engaged in various public relations activities in order to promote Australia Day and to establish its credentials as the national day. From the early nineteenth century through to the present, local media outlets have had a dynamic relationship with Australia Day. Yet while they have been active proponents of Australia Day, their support was not unconditional. The emergence of various bodies with the specific aim of promoting Australia Day would alter this relationship, with the media becoming a potential adversary. As such, media relations assumed a more central function in the promotion of Australia Day. By charting the growth and development of media relations that have accompanied Australia Day celebrations, this study not only documents the evolution of media relations practice, but also reveals the extended history of public relations in Australia and its presence in everyday Australian life. Governments worldwide are increasingly attempting to use the internet to engage citizens. After an initial focus on delivery of information and services via what technologists call Web 1.0, strategies referred to as âGovernment 2.0â and e-democracy have turned attention to using interactive Web 2.0-based âsocial mediaâ to engage citizens in consultation and participation to redress a concerning âdemocratic deficitâ and reinvigorate the public sphere. Even in countries with compulsory voting, such as Australia, electoral enrolment, voter turnout and formal voting are declining. While much focus has been given to expedient political use of social media during election campaigns, an understudied area is how disengaged citizens and youth can be encouraged to engage or re-engage in democratic participation on an ongoing basis. This article reports analysis of initiatives by national, state and territory electoral commissions in Australia and New Zealand to use social media to engage citizens in political participation. With the so-called 'Arab Spring' attributed at least in part to social media, communication scholars, sociologists, and political scientists concerned about a democratic deficit in many countries are looking optimistically to social media to reinvigorate the public sphere. However, research indicates that many claims in relation to social media are over-stated. This article reports critical analysis of five case studies of recent attempts by electoral management bodies in Australia and New Zealand to engage citizens in democratic participation that raises fundamental questions about the agonistic practices of social media and their relevance and role in representative and deliberative democracies. Study of use of social media by Australian federal politicians in the 60 days immediately following the 2010 election. A report of qualitative research examining the objectives, methods used, and learnings of online public consultation trials conducted by the Australian federal government in 2008 and early 2009 as part of its commitment to e-democracy or what others call government 2.0. A critical analysis of media business models to sustain media in the 21st century raning from new forms of advertising and subscription to charging for content behind 'paywalls'. An analysis of the use of social media in public relations, particularly focussing on interactive applications in a Web 2.0 and emerging Web 3.0 environment. An analysis of the history of public relations in Australia through a case study of the creation and promotion of Australia Day which shows PR deeply involved in the historical, social, and cultural fabric of society. An anlaysis of the emergence of new forms of media and how they are impacting public communication, emphasising changing practices as well as technologies. An analysis of public relations practice through content analysis of 10 media spokesperson training programs, reporting evidence of a 'control paradigm' of communication, with focus on "control" and "managing" messages and the media, and lack of two-way interactive communication. Internet media have come under increasing examination since the early 1990s within a number of theoretical frameworks, including their use and potential influence in the public sphere of political discourse. Increasing use of internet media was identified in the 2000 and 2004 US presidential elections, with the latter being described as 'a critical turning point'. However, the development of what,some call 'new media' or 'social media' based on Web 2.0 internet technology has overtaken many Endings of previous research. Some of the most popular Web 2.0-based media currently in use were developed after 2004. These technological changes, coinciding with declining television viewing and newspaper readership, suggest that new forms of internet media need ongoing critical review. This paper analyses findings join a study of internet media use in the 2007 Australian federal election and explores their implications in relation to the public sphere. Macnamara, J. 2008, 'Two-tier evaluation can help corporate', PRism OnLine PR Journal, vol. 4, no. 2, pp. 1-7. Macnamara, J. 2000, 'The 'Ad Value' of PR', Asia Pacific Public Relations Journal, vol. 2, no. 1, pp. 99-104. Macnamara, J. 1999, 'Research in Public Relations: A review of the use of evaluation and formative research', Asia Pacific Public Relations Journal, vol. 1, no. 2, pp. 107-134. Evaluation in various fields of strategic communication has focussed for some time on outputs rather than outcomes and impact, and researchers have lamented a 'stasis' and 'deadlock' in relation to evaluation in practices such as corporate communication (see iesc 0049), public relations (see iesc 0140), and some specialist fields such as health communication (see iesc 0082). However, a number of initiatives in the US, UK, and Europe have brought fresh focus to the importance of identifying and demonstrating the impact of communication – albeit questions including 'impact on whom' and 'for whose benefit' remain important matters for debate in the context of strategic communication as it is defined in this encyclopedia. This section summarizes recent progress in assessing and demonstrating the impact of communication as well key issues for further debate and research. This chapter builds on discussions and themes in this handbook by turning focus to one further fundamental of engagement that has received far too little attention in corporate, marketing, organizational, government, and political communication and in public relations – that is, how and how well organizations listen to their stakeholders and publics. This chapter reports empirical evidence from a two-year, three-country study that shows many government, corporate, and non-government organizations listen infrequently and poorly and, when they do listen, it is mainly for instrumental organization-centric purposes. Noting that communication is defined as a two-way process built on dialogue rather than monologue, that dialogue is more than turn-taking at speaking, and definitions of engagement, this analysis argues that much greater attention needs to be paid to organizational listening and presents proposals for how this can be operationalized. Because of the central role mass media and, more recently, social media play in contemporary literate societies, and particularly because of intensive interest in and often concern about the effects of media content on awareness, attitudes, and behaviour among media consumers, analysis of media content has become a widely-used research method among media and communication scholars and practitioners as well as sociologists, political scientists, and critical scholars. This chapter examines the history, uses and methods of media content analysis, including qualitative as well as quantitative approaches that draw on the techniques of textual, narrative and semiotic analysis; explains key steps such as sampling and coding; and discusses the benefits of conducting media content analysis. Informs readers on how to apply social media in public relations practice. This chapter contributes to critical thinking about public relations in two important ways. First, it reviews key literature and synthesizes the findings of several international research studies which reaffirm that claims made in the dominant paradigm of Excellence theory and other popular theories of PR and corporate communication for two-way interaction, dialogue, co-orientation, relationships, and even symmetry between organizations and their publics are largely illusory and require rethinking. Research involving a range or organizations shows that PR and 'strategic communication' are primarily implemented for dissemination of organization messages and persuasion and these approaches are continuing even in social media which explicitly advocate interactivity and sociality. Drawing on recent research and critical studies, this chapter calls for PR to facilitate the integration of organizations into society for mutual organization-public benefit, rather than contribute to power relations that privilege organizational interests. Second, in advocating a social integration model of public relations, this chapter takes an important step towards praxis, which Hegel, Marx and other founders of critical analysis advocated as part of criticism, by exploring how such an alternative model of PR might be operationalized. In doing so, it offers some answers to the critics' critics by advancing critical thinking towards practice, as well as contributing to critical PR theory. A compendium of 500 articles on the history and contemporary practice of media corporations, individuals, industries, audiences, policy, and regulation in relation to Australian media from publication of the first Australian newspaper in 1803 to contemporary media developments. Broom, G.M. & Macnamara, J. 2009, 'Step Four: Evaluating the Program' in Broom, G.M. (ed), Cutlip & Center's Effective Public Relations - Tenth Edition, Pearson Prentice Hall, United States, pp. 349-377. Macnamara, J. 2008, 'Research for Planning and Evaluation' in Tymson, C., Lazar, P. & Lazar, R. (eds), The New Australian and New Zealand Public Relations Manual, Tymson Communications, Sydney, Australia, pp. 118-153. The presence of a concerning and seemingly growing 'democratic deficit' in a number of democratic countries is widely acknowledged and discussed in political communication, sociology, and critical literature. In 2016 in the wake of the shock UK referendum vote to leave the European Union, commonly referred to as Brexit, the Prime Minister of the UK, Theresa May, publicly acknowledged that many citizens feel that their voice is 'falling on deaf ears'. This article reports the findings of an intensive six-month ethnographic and participatory action research project working inside the UK government from June to December 2016 immediately following the Brexit vote that examined government communication and identified a number of serious failings in listening to and engagement with stakeholders and citizens. It argues that this 'listening deficit' is a significant contributor to the democratic deficit and identifies strategies necessary to improve listening to increase access to policy making and give voice value, which in turn can reinvigorate democracy, increase trust, and create social equity. Despite cautionary analyses and critiques by some scholars, cyberoptimism and what Steve Woolgar calls cyberbole continue to characterise much discussion of social media in the context of democratic politics (e-democracy) and citizen engagement and participation, and is evident in claims of emergence of the 'social organisation' and 'social business'. This paper synthesises the findings of three recent research studies, which show that the allegedly democratising social interaction and dialogic affordances of Web 2.0 are not being realised in many applications. Key missing prerequisites for engagement, exchange and inclusion are identified and highlighted as issues for attention in research and practice. While product placement and 'advertorial' have been used by advertising and public relations for the best part of a century to place sponsored messages in media content in covert ways, a raft of new techniques and formats for 'embedding' marketing and promotional messages in media content are emerging which take these practices to a whole new level and raise major questions about media transparency and ethics. These go by a range of names including sponsored content, integrated content, and native advertising. This paper presents a critical analysis informed by a case study of a state government agency that, in its search for more effective approaches to health communication, uncovered a lack of definitions, guidelines, and transparency in a number of emerging media practices that warrant close attention by researchers, industry regulators, and professional bodies. Macnamara, J. & Zerfass, A. 2012, 'Social media communication in organisations: The challenges of balancing openness, strategy and management', Refereed Proceedings of the 62nd Annual International Communication Association Conference, 62nd Annual International Communication Association Conference, International Communication Association, Phoenix, AZ, pp. 1-23. Report of a survey of social media use by organisations in four Australasian countries, compared with data from a similar survey in Europe, showing use mainly for transmission of organisational messages, with a lack of interactivity, dialogue and engagement. Macnamara, J. 2011, 'Filling the gap at the centre of social media strategy and management: Qualitative insights from Australasia', 61st Annual International Communication Association conference, Public Relations Division Panel Session, International Communication Association, Boston. Macnamara, J. 2010, 'Trends in social media use in Australian political communication', Double Vision: Biennial International Australian Studies Association (InASA) conference, Double Vision: Biennial International Australian Studies Association (InASA) conference, Australian Studies Association (InASA), Sydney, pp. 1-28. A quantitative and qualitative analysis of the use of social media by Australian politicians and major political parties during the 2010 federal election. Contemporary scholarship recognises the importance of diversity and open ongoing construction and reconstruction of knowledge to remain current and relevant. However, content analysis of fourteen contemporary public relations prescribed texts and reference books supports claims of a Western, and particularly a North American, dominant paradigm and identifies four problematic gaps in contemporary public relations scholarship. This article argues that these require significant shifts in epistemology as they are limiting the efficacy of practice in the Second Media Age of interactive social media and social networks, the social relevance of the practice, the education of future generations of practitioners, and potentially stifling theory-building. Addressing these four gaps will offer increased potential for public relations to expand its remit, influence, and reputation within organisations and societyalbeit in a reconfigured form responsive to the social, cultural and political environments in which it operates. Macnamara, J. 2009, 'Media as practice 2.0: Towards a historical and integrated reconceptualisation of media', Australian Media Traditions 6th Biennial Conference: Internationalising Media History: From Australia to the World, University of Sydney, Sydney. This paper argues that focusing on 'media as practice', as proposed by Nick Couldry (2004) reconceptualises media in a historical context and escapes the narrow framework of mass media theory which focuses on particular technologies of production and distribution, and accumulation and maintenance of mass audiences. Whereas other approaches to studying media focussed on political economy, media effects, texts, or audiences tend to narrowly examine either media production, distribution or consumption, a media as practice approach examines media as complex interrelated and integrated practices of production, distribution and consumption and affords understanding of media today which include citizen media and social media in which 'prosumers' or 'produsers' engage alongside traditional content producers and distributors. After its landslide victory in the 2007 Australian Federal election which was widely described as the YouTube election, the Rudd Labor government launched a series of trial public consultation blogs in 2008 as part of a commitment to e-democracy through the use of interactive Web 2.0 communication applications. At the same time, Barack Obama swept into power in the United States aided by Web 2.0 media including text messaging, blogs, YouTube, Twitter, and social networks such as Facebook which gained unprecedented levels of online political engagement. While e-democracy and e-government have been emerging concepts in many countries over more than a decade, these two experiences provide new information on the successes and challenges of online citizenship. This paper reports key findings of research into the Australian governments 2008 and early 2009 e-democracy efforts and compares these with US e-democracy initiatives including the Barack Obama presidential campaign and recent international research findings. Like the 2007-2008 US presidential primaries, the 2007 Australian federal election was described as 'the YouTube election' and an 'internet election' (Media Monitors, 2008). This followed studies of use of what are termed 'new media' for political communication in a number of campaigns including the 2000 US presidential election (Bentivegna, 2002, p. 50) and the 2004 US presidential election which was described as 'a critical turning point' (Xenos and Moy, 2007, p. 704). However, the development of web 2.01 internet media, expanding broadband, and other changes have overtaken many findings of previous research. Some of the most popular new media currently in use were 'invented' post-2004. The rapid rate of technological and social change makes new media research particularly time-bound and indicates that ongoing empirical studies and analysis are needed. This paper contributes to understanding of how new media are used in political communication and how they influence the public sphere (Habermas, 1989, 2006), particularly looking at public interaction and participation (Carpentier, 2007) which have been identified as key features of web 2.0 media and as requirements of an active public sphere, based on findings of a study conducted by the Australian Centre for Public Communication at the University of Technology Sydney during the 2007 Australian federal election.